Faced with the specter of rolling blackouts last winter, competing energy interests argue about what lessons to learn. As Maine and New England shivered through last winter’s historic cold spell, the region’s electric system faced an unprecedented prospect: rolling blackouts. Several troubling circumstances were converging. Natural gas was scarce and pricey. A power line failure sidelined one of New England’s largest power plants. Solar panels were covered with snow and wind turbines were buffeted by storms. The combination forced grid operators to ramp up 1960s-era technology to keep the lights on. For the first time, they strategically juggled the generating periods of aging oil-fired plants, which burned 2 million barrels of oil in the two weeks between Dec. 26 and Jan. 9. With sea ice and storms delaying deliveries, these plants only had 19 percent of their average inventories left when the weather finally eased. As summer approaches, the cold snap is just an unpleasant memory for many residents. But the performance of New England’s electric system during that period has sparked a debate among interest groups about what lessons can be learned from the experience. For ISO-New England, the grid operator, the events proved to be a real-world stress test that highlighted some of the concerns raised in a recent analysis of the electric system, which focused on whether it has enough fuel resources to always operate reliably in 2024. Rolling blackouts, or what the industry calls load shedding, involves the deliberate shutdown of electric power on parts of the grid to prevent the failure of the entire system. Since 1971, when the New England Power Pool was created to centralize dispatch, there has been no systemwide load shedding, according to ISO-NE. On a local level, load has been reduced in a few instances, such as after a lightning strike near Boston in 2012. But even the specter that operators might need to selectively switch off power to save the grid is proof to large electricity users in Maine that it’s past time to increase natural gas pipeline capacity in the region. But a regional environmental group says last winter’s events actually support the opposite conclusion. According to a new study done for the Conservation Law Foundation and other interests, the ISO-NE fuel analysis report is flawed. The best way to maintain a reliable grid, it says, is with continued investments in efficiency and renewable energy. The group also charges ISO-NE with “engaging in fear mongering” to push increased use of natural gas, which currently fuels half the region’s power plants. One area of agreement is that it was frigid and snowy during the period. Boston recorded its most extreme cold wave in a century. Bangor saw record low temperatures from Dec. 23-Jan. 5. On Jan. 4 and 5, a powerful winter storm blanketed the Northeast with one of the most-intense blizzards in years. All this strained the power grid, and the specifics were recounted by ISO-NE in an April summary. With natural gas in high demand for heat and power-plant fuel, wholesale gas prices began spiking after New Year’s Day, rising to levels where oil was cheap by comparison. That led ISO-NE to dispatch dozens of aging oil plants that typically remain idle, such as Wyman Station in Yarmouth. They participate in a program in which they are paid to stockpile fuel for winter emergencies. These oil plants produce less than 1 percent of New England’s power, on an annual basis. But over the two-week period, they generated 27 percent. They burned 2 million barrels (84 million gallons), more than twice of what they went through in all of 2016. Even a few of the region’s remaining coal plants fired up. On Jan. 4, just as a winter storm was intensifying and battered the region, the situation went from bad to worse. The Pilgrim Station nuclear plant in Massachusetts shut down after a transmission-line failure. That took a key, non-fossil fuel generator out of the mix. Meanwhile, snowstorms and ice-choked waterways made it hard for trucks and barges to replenish the oil plants. On Jan. 7, ISO-NE took the unprecedented step of “posturing” the oil plants, postponing their operations for later in the day or week, to make sure they wouldn’t run out of fuel or hit government air-pollution caps. In other instances, the region’s growing fleet of wind and solar energy generators might have been able to help. But data gathered by ISO-NE found that snow and clouds during the period limited solar output to a small fraction of its potential. Generation from wind farms, too, was variable in the fast-changing weather conditions. At times, wind farms also were unable to feed power to the grid because of transmission-line congestion. The cold snap underscored a contrast between the growth of solar and wind, and its role on the grid. April 9, for example, was a cool and sunny day, and the region’s 130,000 or so solar installations broke a record. Their combined output lowered electricity demand by nearly 2,300 megawatts, according to estimates by ISO-NE. That’s equivalent to a handful of large power plants, and the contribution is expected to keep growing. On April 21, solar broke another record. The combination of sunny skies and mild temperatures led to midday demand for electricity falling below what was needed overnight – a first in New England. Wind farms also set regional output records in January. And last year, proposals to build new wind projects in New England eclipsed the output of new natural gas proposals for the first time. But while they’re making important contributions to clean energy and fuel diversity, solar and wind can’t be counted on now for winter reliability, Kakley at ISO-NE said. Kakley said the cold snap and the response to it is informing discussions among policymakers, generators and others on how to prepare for such extreme conditions. THE NEED FOR NEW PIPELINES? Last winter’s experience drew further attention to ISO-NE’s fuel security analysis, which focused on how ongoing power system trends will make it harder to assure reliability in the near future. Demand for natural gas is growing, straining the pipeline system in winter. 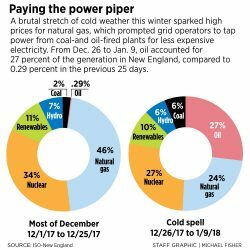 Older coal, oil and nuclear plants – including Pilgrim Station – are planning to retire, because they normally can’t compete with cheaper natural gas generation. Based on these and other factors, ISO-NE developed 23 hypothetical winter scenarios. All but four of them could lead to fuel shortages that might require rolling blackouts in 2024, after the older plants have stopped contributing to the region’s power supply. But the rebuttal study for the Conservation Law Foundation challenged the assumptions ISO-NE used for its computer modeling and convinced the grid operator to do a second run. According to the environmental group, the grid can function reliably in 2024 without building new gas pipelines, if states carry out their goals for renewable energy development and Canadian power purchases, and imports of liquefied natural gas stay on track. But Buxton disputes these assumptions. He made several points: Land-based wind will need new and controversial transmission lines to connect to the grid. Offshore wind planned for the region won’t be built soon enough to backstop retiring plants. Imported LNG is more expensive than domestic, pipeline gas. Last winter also underscored the role of New England’s legacy power plants, such as Wyman Station. As the region shifts to renewables, it still has 106 plants that primarily burn fossil fuel, and 34 so-called dual fuel units, that run on gas but can also burn oil. For Dolan, the cold snap is a cautionary tale about encouraging the ongoing transition to cleaner energy, without losing sight of the continuing role for existing generators.